Kolade Johnson was shot by officers with Nigeria’s anti-cultism police unit during a raid in Lagos on Sunday, according to a statement from the Nigerian Police Force. Members of the unit were searching for a suspect and at one point fired into the air, Johnson’s family and lawyer told CNN. “He had saved up some money while working in South Africa and he returned to Nigeria to start his own music label. He was just getting back on his feet. I can’t believe he is gone,” Lukman told CNN. Johnson’s killing provoked widespread anger among Nigerians, who said the police unit had gone rogue and should be disbanded immediately. “Members of the team suspected to be involved in the shooting have since been arrested and are currently in police custody undergoing interrogation,” Lagos police spokesman Bala Elkana. Nigeria’s Presidency sent its condolences to the family in a post on Twitter and said the Nigerian police have assured the government that the members of the unit involved in the shooting were under arrest and were facing disciplinary measures. Nigeria’s police force also shared photos of two police officers wanted in connection to the shooting. 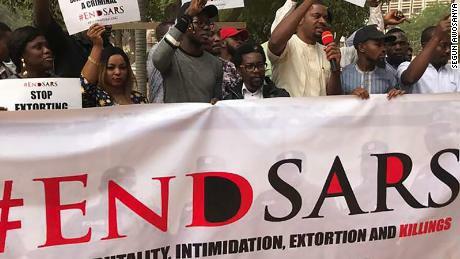 In August 2018, Nigerian Vice President Yemi Osinbajo ordered an overhaul of the country’s Anti-Robbery Police Squad (SARS), which was accused of torture, extortion, widespread brutality and even murder. “Police torture is a stain on Nigerian society that must be addressed with clear orders to law enforcement officers not to inflict torture or other ill-treatment on detainees under any circumstances,” Amnesty International Nigeria said. “We are firmly committed to ensuring these reforms are fruitful. In the particular instance, we will ensure that justice is served,” Akande told CNN.